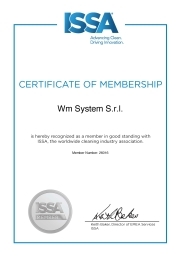 WM System S.r.l. Company type D.I. S.n.c. S.a.s. S.p.a.	S.a.p.a. S.r.l. S.c.r.l. Associazione	ZAO	OAO	OOO	IP	GUP	NPO	L.t.d. P.l.c. U.l.t.d. 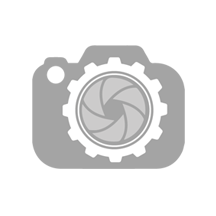 SAS	SEM	SCOP	SA	EURL	SARL	SCA	SCS	SNC	SEP	a.n.d. a.d.	e.G. e.V. GbR	OHG	KG	PartG	KGaA	GmbH	AG	AO	TOO	TDO	GP	KT	Ure	PT	a.d.	d.o.o. k.d. o.d. S.A.	S.L. S.L.L. S.L.N.E. 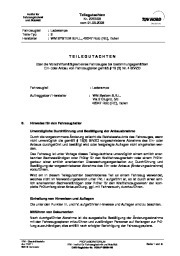 S.C.	S.Cra	AAT	ZAT	PUP	TAA	Verein	eG	KolG	KG	KomAG	GmbH	SNC	SCA	Sarl	SC	AG	SA	B.V.	V.O.F. 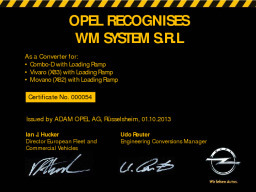 C.V.	N.V.
WM System experience began in 1991 with the production of loading ramps for light commercial vehicles. The competence acquired in over 20 years and the constant improvement of products allow WM System to offer a high–quality products which suits everyone's needs. - LOADING RAMPS: we offer a complete range of manual loading ramps, making your commercial vehicle as practical as possible. Ramps can be customised in length, width and capacity upon clients specifications. This means that you can work easily and efficiently, saving time and effort. - ACCESS RAMPS: a product range specialising in ramps for overcoming architectural barriers. We offer customised products to meet the need to overcome barriers. Multi-purpose solutions for every need. – DYNAMIC : WM dynamic is a-movable and multifunctional work station to intervene directly "on the field" by operating wherever. Our passion and experience have made Wm System leader in them sector. WM System experience began in 1991 with the production of loading ramps for light commercial vehicles. The competence acquired in over 20 years and the constant improvement of products allow WM System to offer a high–quality products which suits everyone's needs. WM SYSTEM IS COMPOSED OF THREE CATEGORIES OF PRODUCTS: - LOADING RAMPS: we offer a complete range of manual loading ramps, making your commercial vehicle as practical as possible. Ramps can be customised in length, width and capacity upon clients specifications. This means that you can work easily and efficiently, saving time and effort. - ACCESS RAMPS: a product range specialising in ramps for overcoming architectural barriers. We offer customised products to meet the need to overcome barriers. Multi-purpose solutions for every need. – DYNAMIC : WM dynamic is a-movable and multifunctional work station to intervene directly "on the field" by operating wherever. Our passion and experience have made Wm System leader in them sector. Опыт WM системы началось в 1991 году с производства загрузки рампы для легких коммерческих транспортных средств. Компетенции, приобретенных в течение 20 лет и постоянное улучшение продукции позволяют системы WM предложить высокий качество продукции, которая отвечает потребностям каждого человека. WM системы ИС состоит три категории OF товаров: - Загрузка рампы: Мы предлагаем полный спектр ручной погрузки рампы, делая ваш коммерческий автомобиль практичен, как возможно. Рампы может быть настроен в длину, ширину и потенциала по спецификациям клиентов. Это означает, что вы можете работать легко и эффективно, экономя время и усилия. -ПАНДУСЫ: ассортимент продукции специализируется на пандусы для преодоления архитектурных барьеров. Мы предлагаем индивидуальные продукты для удовлетворения необходимости преодоления барьеров. Многоцелевой решения для каждой потребности. -ДИНАМИКА: WM динамика является a движимое и многофункциональной рабочей станции вмешиваться прямо «на поле», где работает. Наша страсть и опыт сделали системы Wm, лидер в их секторе. L'esperienza WM System inizia nel 1991 con la produzione di rampe per veicoli commerciali. La competenza acquisita in oltre 20 anni e il costante miglioramento dei prodotti permettono a WM System di offrirvi oggi prodotti di alta qualità, ognuno dei quali adatto a soddisfare le vostre esigenze più disparate. WM SYSTEM SI COMPONE DI TRE CATEGORIE DI PRODOTTI: -RAMPE DI CARICO -RAMPE D’ACCESSO -DYNAMIC Le Rampe di Carico WM sono realizzate in base alle personali esigenze del cliente. Le pedane vengono progettate su misura per i diversi usi che se ne possono fare: pulizie, catering, trasporto persone e più in generale tutte le soluzioni che riguardano la movimentazione di merci attraverso veicoli commerciali. L’utilizzo della rampa WM riduce il tempo di carico e scarico merci, garantisce condizioni di lavoro sicure e professionali, assicurando all’operatore la completa autonomia nello svolgimento del lavoro. Wm System ha inoltre studiato una linea di Rampe d’Accesso per Superare le Barriere Architettoniche; garantendo così l’accesso a ogni abitazione, ufficio o edificio storico. Le soluzioni variano da rampe fisse a soluzioni mobili in alluminio studiate su misura. Offriamo un servizio completo, che parte dalla fase di sopralluogo-progettazione per terminare con l’istallazione in loco della rampa. L’ultimo progetto realizzato da WM è il Dynamic, una postazione di lavoro Autonoma, Mobile e Multifunzionale. Adatta ad ogni genere di servizio per lavorare ovunque, in ogni condizione e per ogni situazione. Si contraddistingue per la grande flessibilità e per non avere limiti.